...Or there could be more than one cavern with Dodongos in it? Also, all the talk about Link becoming the Hero of Time in Ocarina of Time, such as the Master Sword description, implies that there was a Hero of Time before him. Want to debunk bad non-Zelda theories? The post was edited 1 time, last by Nitro Indigo ( Oct 14th 2017, 6:38am ). Dodongo's Cavern is capitalized, meaning that it's the name of an actual place like in OoT, not just a random cave with dodongos in it. The Hero of Time is a prophecy; he is the whole reason the Temple of Time and everything connected to it exists. In the Japanese version of SS, Demise doesn't say anything about waiting for eons. "The (Star Wars) EU is a bloated, wretched mess." Yeah, I think we found that out during some thread somewhere. BotW DLC 2 screencaps have been added! Feel free to add anything you find here as well. 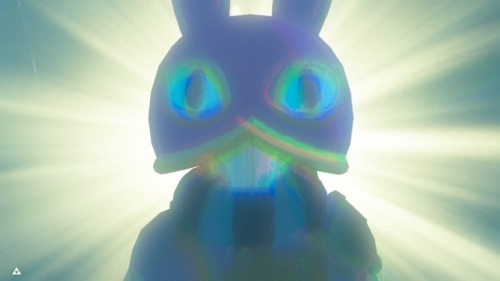 This screenshot is important because it shows DLC2 takes place in the Donnie Darko movieverse. RE: Link's flurry rush, Teba and his kid say a similar thing at the flight range, how it seems Link slows down. RE: Further proof that it's not the Triforce, it's hard to say whether or not the Triforce is the root behind that sealing power. 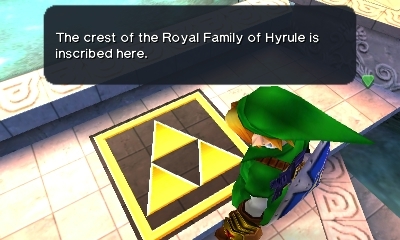 The crest of the Royal Family features a loftwing's body below the Triforce. RE: Goron Link in MM, he can only walk on shallow lava, similar to how when we use the metal box to jump onto the ring. The box and shallow lava still burn you unless you've upgraded your flamebreaker armor twice. Aside from that, by Goron Link standards, Gorons can't swim either, and we all know that's not true. RE: Kohga founding the Yiga, where did you get the idea that the Yiga are as old as the tapestry? 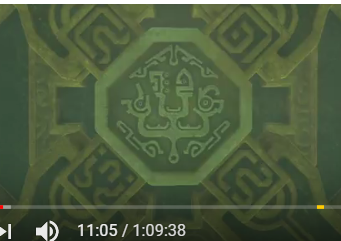 I think there are also Sheikah characters on the four locks in Maz Koshia's trial. Gonna go check out if I can get a screenshot. Clockwise from top left, WAFE. Maybe the initials of the first champions. They are on the Tapestry. It's in the legend that after the first Calamity 10,000 years ao, the Divine beasts were seen as a threat and the Sheikah were forced to live meager lives. Some got salty and split. I think they aren't quite 10,000 years old, as the tapestry was probably made a good amount of time after the 1st CG, but they do seem to be quite old. Also, the treasure chests in the corresponding sections to the locks have Zora, Rito, Goron, and Gerudo equipment in them respectively. The post was edited 2 times, last by LLLLLink ( Dec 11th 2017, 3:54am ). Kind of odd; the Gerudo section was more about electricity. Otherwise, it does fit the four elements to a T, never realized it. I think it has something to do with sand and static electricity. A Rito and a Zora were the earth sages. Maybe the connection is less apparent than we thought.